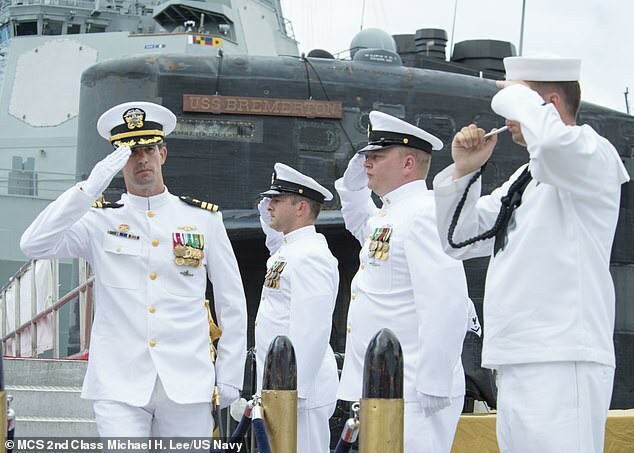 Captain Travis Zettel (left) takes a salute on the nuclear-powered attack submarine USS Bremerton. Picture by MCS 2nd Class Michael M Lee/US Navy. The commander of the US Navy’s longest serving submarine was relieved of his duties after he hired prostitutes in Subic Bay. Captain Travis Zettel commanded the nuclear-powered attack submarine USS Bremerton. According to an investigation by the US Naval Criminal Investigative Service, the captain told a fellow sailor he had “ordered 10 girls to arrive at the hotel” while they were ashore at the former US Navy base. He was later seen in the company of about 10 “provocatively dressed females outside the front door of the hotel”, a witness told investigators. The probe was launched after an anonymous tip-off by a sailor to the Department of Defense Inspector General’s hotline. According to the report, Zettel admitted “culpability in the payment of female accompaniment” during the incident in March last year. He was relieved of duty in August due to “a loss in confidence in his ability to command” and reassigned to the staff of Submarine Squadron 19. The decision to relieve him of duty was announced at the time but no details were made public. The facts of the case emerged after a freedom of information request by the Kitsap Sun newspaper in Bremerton, Washington, which published on Friday (December 11). Another sailor, whose name was redacted in the documents released to the newspaper, was spotted with three “local females holding onto his arm as he was wandering around” greeting sailors from his command. Zettel, who is married, took command of the USS Bremerton in August 2016. “Becoming the 15th commanding officer of the now 35-year-old ‘American classic’ is a proud moment for me and my family”, Zettel said after his posting was announced. The submarine had previously been based at Pearl Harbor. It has been in service for 37 years and is currently being decommissioned. More power to him. He did nothing wrong. If he paid for some entertainers, so be it. Why would the Navy care? Because the Navy wants to make morals policy for all sailors to obey. The Navy should concentrate on defending our freedom and realize sailors have minds of their own and do not need the Navy to be their moral guidance. Sub is being de-commed anyway. Maybe he will get a new command when this blows over. Can’t blame a submariner from wanting some entertainment after being locked in a metal tube with 100 other randy guys.